"...I could have made an album with singing on it, but that wasn’t what I wanted. I wanted to make record where the songs spoke to you through my playing." I was reading an old JIMI HENDRIX interview a few years ago, where Hendrix said something, like “Women who play Rock & Roll are looked at like they’re aliens.” Of course, Hendrix made this statement to say that some males act as if women ‘can’t rock’ when in fact we know they damn well can. This has me thinking back to to NAMM 2012, when NITA STRAUSS was on the convention floor jamming through some IRON MAIDEN tunes in that now infamous Youtube clip. I witnessed some onlookers who were ‘dumbfounded’ that Strauss could play like that! I immediately thought back to that Hendrix quote. 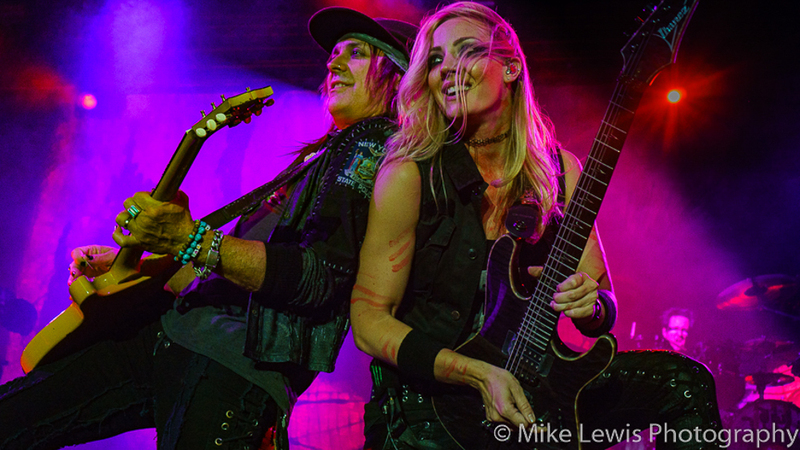 NITA STRAUSS has spent a portion of her musical career as a ‘hired gun’ performing with the likes of JERMAINE JACKSON, FEMME FATALE, THE IRON MAIDENS and most recently with her day gig with Rock & Roll Hall OF Famer ALICE COOPER. 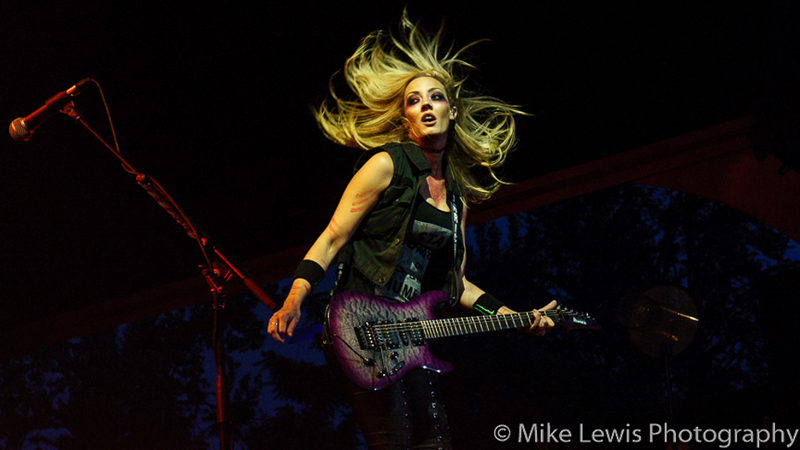 She’s been a part of ALICE COOPER’s band since June 2014, when she stepped into the vacancy left by ORIANTHI. 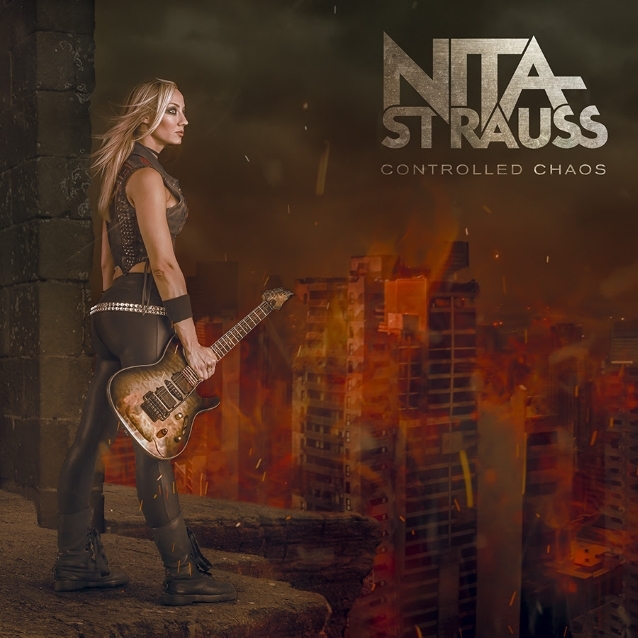 The virtuoso will issue her first ever solo album titled Controlled Chaos on November 16th, 2018. She’s excited about it, we reached out to her about it and here’s what she had to say. KNAC.COM: You’re about to release your first ever solo album Controlled Chaos on November 16th. It’s an instrumental album, what sets your record apart from others? STRAUSS: It’s been a process to get this album together. It’s been a long time in the making but this is the album that I’ve always wanted to release. I can say this: this is the album that I envisioned, that I would release since I started playing guitar. All my musical heroes have been guitarists, [STEVE] VAI, [JOE] SATRIANI, PAUL GILBERT, YNGWIE MALMSTEEN, I’ve always wanted to make an album that followed in their footsteps. It took a long time to put together Controlled Chaos because of my amazing day job, playing in the ALICE COOPER band. When Alice took some time to do some touring with THE HOLLYWOOD VAMPIRES, I took full advantage of the time to work on this record and make it a reality. I wanted to make an instrumental album. I guess I could have made an album with singing on it, but that wasn’t what I wanted. I wanted to make record where the songs spoke to you through my playing. I think I achieved just that, I’m really proud of this album. I really wanted this album to showcase what I can do and that is play guitar. KNAC.COM: You have a tour coming up, I just saw some of the dates later this Fall. STRAUSS: Yes, I have to be really strategic and work this tour around other stuff that I have scheduled. I’m busy, but I have to say that it’s a great problem to have! [laughs] I’m going out on my first ever solo tour, it’s exciting. I’m even more excited that I get to do a co-headline tour with one of my favorite guitarists ANGEL VIVALDI, so to go out with an established guitarist like him, it’s such a blessing. I’m extremely excited, the tour runs from November 19th through December 21st. KNAC.COM: You performed during the the now defunct AFL home games for the ‘L.A. KISS.’ How many people auditioned for that gig? KNAC.COM: And what was it like to have Gene Simmons and Paul Stanley as your employers? STRAUSS: I didn’t work directly with them, though I was little star struck the first time I met them. I mainly worked through the talent department, I didn’t work directly too much with Gene and Paul, but they were very nice to work for. When I was leaving and the last half of the season, I had a great conversation with Paul. I had just landed the ALICE COOPER tour and had to make a decision to do one thing or the other. I had to let them know I was having to leave but I had a good reason! [laughs] This was the MOTLEY CRUE farewell tour with ALICE COOPER supporting. Gene and Paul were extremely understanding. On the last day, Paul pulled me aside and said, “Listen, if we have to lose you to anyone, I’m glad it was the ALICE COOPER organization because they are going to treat you really well.” I have a lot of respect for him because of that. He didn’t have to do that, but he did and that was really, really cool of him. KNAC.COM: Is there a particular sports team that you follow these days? STRAUSS: As you know for the longest time L.A. didn’t have a NFL Football team, we didn’t have anyone to get behind. I’m pleased that we have the L.A. Rams, because for years L.A. sports fans have been pledging their allegiance to other teams. I’m so excited that the L.A. Rams are doing so well this year, I really am. KNAC.COM: I hate to say it but they’re playing awesome again, this season. STRAUSS: [bursts into laughter] I know, right?! KNAC.COM: You’ve also done some work with the WWE. How did you get involved with sports entertainment? STRAUSS: First and foremost, I’m a huge fan of wrestling. So it was easy to be a part of something, when you already have a love for it. I first got involved with sports entertainment, before WWE at an indie pro wrestling show called PCW Ultra. I was going to the shows regularly and then I was asked to play wrestler’s entrance music, till they got to the ring. My manager had this vision to take this to the big stage, the WWE. He said, “I have this vision of you playing at ‘Wrestlemania.’” We didn’t didn’t know anyone, we knew some wrestlers, but no one at the top that could make the right call for us. So we got some contacts and we started asking around and finally the right door opened. So in talking to some key people we were to talk to the right people and we got ‘Wrestlemania.’ Ever since then we’ve had a great relationship with WWE and we’ve got some exciting stuff coming up, which I’ll reveal in the future. KNAC.COM: What’s your favorite ‘old-school’ wrestler? Who’s a wrestler that you’re a huge fan of these days? STRAUSS: Oh man, ‘old-school,’ I’d have to go with THE ULTIMATE WARRIOR, from the time he would hit the ring and the way he’d shake the ropes, his attitude and his charisma was just awesome. I know he wasn’t the most well spoken wrestler on the mic, but I thought he was really cool, he’s my favorite wrestler. New wrestler? I think I’d have to go with ‘heel’ BECKY LYNCH, I see her as the female ‘STONE COLD’ STEVE AUSTIN, because no matter what she says, no matter how far her ‘heel’ foot turns, the crowd will still get behind her. I love to hear name, I love to watch the crowd support her and she’s worked so hard to get where she is at. That’s just amazing to me. KNAC.COM: You were part of THE IRON MAIDENS for a few years. How big of a MAIDEN fan were you going into that band? STRAUSS: Yeah, the band just celebrated their 17th anniversary, can you believe it? Oh, it was so much fun playing in that band. I joined them the year they celebrated their 10 year anniversary. Before I joined I remember that you couldn’t go anywhere and not see these posters promoting gigs with these five badass girls on them. The had a loyal following even early on because of their ability to perform the songs and their stage show. They had the full stage show with screens, and their own ‘Eddie.’ They were legendary even back then, but to play with them from 2011 to 2014 was an amazing musical education. I got a chance to cut my teeth from day one. I went on tour and played a bunch of shows, I got used to being on stage and dealing with mishaps. Anything that can go wrong will and I learned how to deal with that. KNAC.COM: Is there a particular mishap that stands out? STRAUSS: With THE IRON MAIDENS or in general? KNAC.COM: Either THE IRON MAIDENS, ALICE COOPER or any other gig.